I was contacted by a dear high school friend a few weeks ago about the possibility of making a quilt for her sister-in-law. My friend’s father-in-law is a rockabilly drummer living just outside London, and her husband makes a living as a jazz bass player, so the music vibe runs in the family. 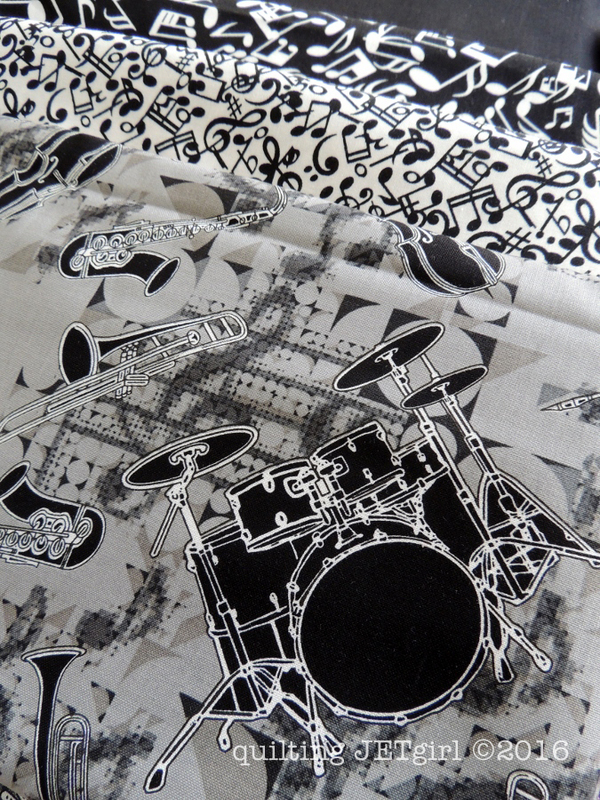 It didn’t take long to find one perfect print featuring a full drum set (score)! 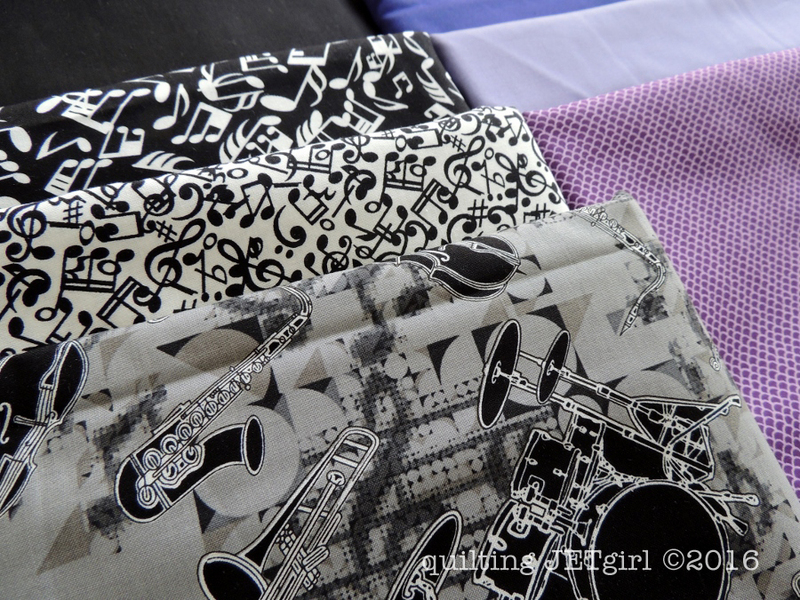 I have a bit of a musical background, albeit far back in my childhood, so I am pretty excited to be playing around with a music themed set of fabrics. After consulting with my friend a bit about an accent color to keep the quilt from being just black and white, we settled on purple. And again, I was really excited to find a fun print to work with. I thought that the tiny “scales” print was an awesome play on words (music scales), and thankfully my friend agreed! I am looking forward to getting started on this commission. Linking up with Sunday Stash. Oh, that looks like a really amazing combination! I’m so excited to see the baby quilt! Those all look great together! an’t wait to see what you come up with. I’m looking forward to seeing what you “drum up” for this baby quilt. Excellent fabric choices. What a fun pull! I look forward to seeing where you go with this! Oh how very fun this is gonna be! I’m almost jealous – it would be so fun to design a quilt for a musical baby! Can’t wait to see what you do with it!! This is going to be such a great and not the ‘normal’ baby quilt at all! Love the fabric, but the drum fabric speaks to me! My husband is a drummer and I can’t help being drawn to it…for him! Yvonne, the fabric selections are marvelous! I suggest that while this quilt is being assembled from step one all the way to the last binding stitch that you are playing music that just makes you want to get up and dance! It really is great fabric and I think the purple is a great accent…I am biased since any color of purple is my favorite color…have a fantastic time creating this masterpiece! 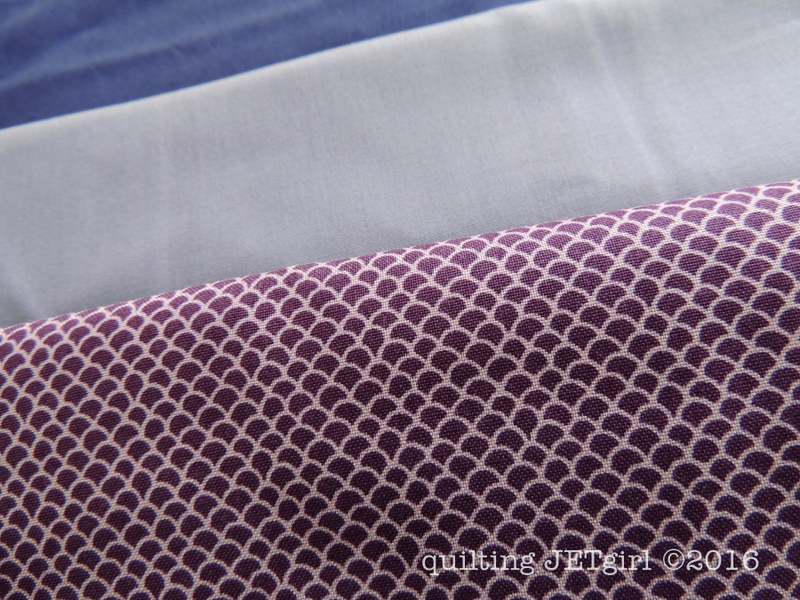 Those are awesome fabrics, I really love the pops of purple. I can’t wait to see what you do with them. Fab finds! I love that scales fabric! Great prints. Can’t wait to see what you come up with. Love those prints! I’m not sure you could have put together a better grouping for the project. Can’t wait to see what you come up with. Can’t wait to see what you do with this set of beautiful fabrics. That print with the drum set is so neat, hopefully your plan has some big patches to really showcase that graphic print! What fun fabrics together! I’ve never seen that scales fabric, what a great blender! What a great combination, love the ‘scales’ play, it looks like it’s going to be a very cool baby quilt. Oh, my god. I love the purple scales fabric. Yes, even though it is purple!